Electric tooth brushes are more effective at removing plaque and bacteria than a manual toothbrush. It is the mechanical advantage (the tooth brush bristles move faster than you can brush) and the built in two minute timer that make electric tooth brushes better than manual brushing. With electric tooth brush use there is a decrease in the bacteria that cause decay and tooth loss. Electric tooth brushes are one of the best investments you can make. Modern electric tooth brushes have home and travel charging bases. Electric toothbrushes can more efficiently clean teeth. In conjunction with daily flossing and mouth rinse use an electric toothbrush is your best bet to not have any dental problems. 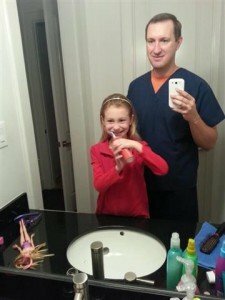 Michael Nugent DDS serves Pasadena, Texas. Dr. Nugent is a leader in Cosmetic, General, Implant and Sedation Dentistry. If you have any question about dental sedation, then you owe it to yourself to talk to a proven dental sedation leader. Dr. Nugent has been helping Pasadena residents over come their dental fears with sedation dentistry.